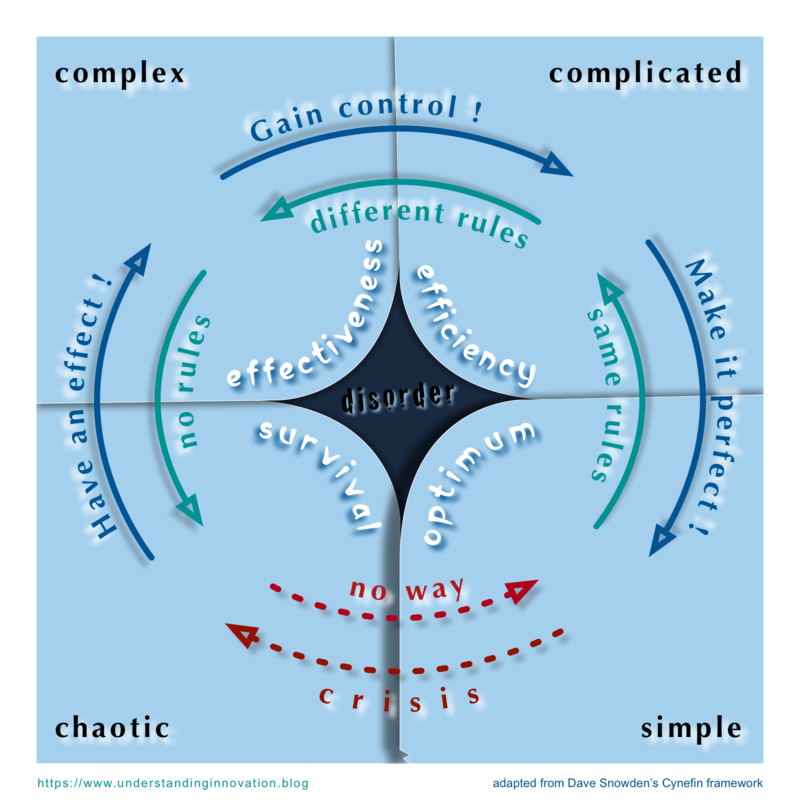 Over the past few weeks, I introduced you to a sense-making model developed by Dave Snowden: the Cynefin framework. Falling into the five domains of simple, complicated, complex, chaotic, and disorder, this framework can serve as a map to give you some orientation in challenging situations of decision-making or problem-solving (you’ll find more detailed information in the general description and a set of examples). Today, let’s take a closer look at how you can read this map. In each the domains, you’ll have to pursue a different objective. In the chaotic domain, your primary goal is survival, paired with the ambition to get to a less life-threatening place like for example the complex domain. If you are in the complex domain, you strive for effectiveness, for causing a desired change. In the complicated domain, your focus is on efficiency, on structures and processes that increase your productivity. When your are the simple domain, you go for the optimum, for the perfect solution. But mind the domain of disorder, of not knowing where you are, of misjudging your situation. You’d enter this domain unknowingly and at immense risk of catastrophic failure; hence the only objective is to understand where you really are and then act accordingly. The boundaries between these different domains are in no way solid, they do not confine compartments or categories that are clearly walled-off one against the other. Rather, these boundaries are blurry; they are more or less gradual transitions. And perspective matters as you move from one domain to the other. Your direction of travel actually shapes your perception of the differences and challenges you face. That’s what the following chart is all about. Let’s start in the simple domain (bottom left) for a counterclockwise journey. Moving to the complicated domain, you’ll find that the same rules still apply. Even though you have more components and actors to work with, you can still predict their actions and reactions, and you can plan accordingly. Your maths has become more challenging, but you can still do it. Entering to the complex domain, you’ll definitely leave that comfort zone of known rules. Instead you will observe that fundamentally different rules are at work, but you’ll have a hard time to discern what they really are. While you may well explain a sequence of past events, you have no means to make predictions for future events. Hence planning loses its meaning, while experimentation becomes the all-important tool of the trade. Things get really unpleasant when you move to the chaotic domain. You’ll have the impression that there no rules at all. Whatever you try, wherever you move, you’ll find drift sand and quagmire, with no solid ground to stand on. You want and need to leave this place as quickly as you can. You might try to get from the chaotic to the simple domain, but there’s no way for you, no path you could take to overcome the steep cliff in front of you. Instead, you’ll have to turn in the opposite direction and try to leave the chaotic domain for the complex domain. To get there, you’ll need to have an effect on the situation. Any effect will be good to help you get some feeling of what’s going on, and to stabilise the situation. From such a consolidated basis, you can then experiment a little more to understand the situation better. Moving to the complicated domain, you’ll want to gain control over the situation. You’ll break your problem into bite-sized chunks that you can resolve with the resources you have. If the type of problem occurs more often, you’ll establish dedicated structures and processes to address them. Over time, and if the type of problem arises frequently, you’ll seek ways to increase the efficiency of your structures and processes. That’s when you are entering the simple domain again. You are trying to make it perfect: optimising structures and processes, perfecting your organisation, defining standard operating procedures, reducing complexity until you have a lean, mean machine that is perfectly geared to solve exactly the one type of problem you are faced with most often. But wait! The closer you get to perfection, the more susceptible you’ll be to new, unforeseen challenges. You run the risk of being overwhelmed by an external shock that could push you over the cliff into the chaotic domain again, and into a state of crisis. Whichever way you turn, there’s a danger zone between the simple and the chaotic domains. At the edge of simple domain, you could fall off the cliff, if you believe that your past successes made you immune to future problems. And in the chaotic domain, your problems might be too big or too fast for you to escape. Just think about the business world and how entrepreneurship and disruption play out in this zone. Start-ups often operate in the chaotic domain, struggling to reach the safer shores of the complex domain. However, a successful start-up can easily push a market leader from the comfort of the simple domain over the cliff into the chaotic domain. This can even include a dramatic period in the domain of disorder for as long as it takes the former market leader to accept that its business model is busted and to take up a serious fight for survival. Read this way, the Cynefin framework can serve as a backdrop for business strategy that helps you understand your and your competitor’s situation, each in terms of opportunities in the offense as well as the strength or weakness of the defensive position. Still, given the risk and cost of failure in that danger zone between the simple and the chaotic domains, it is highly advisable to avoid the South. Instead, you should focus your activities in the North, i.e., in the complex and complicated domains. And that is already challenging enough, as I’ll discuss in an upcoming post.